Moong dal Rava Pongal recipe is made from Rava (known as suji/ sooji / cream of wheat / semolina) and moong dal (green lentils)is a easy South Indian breakfast dish. 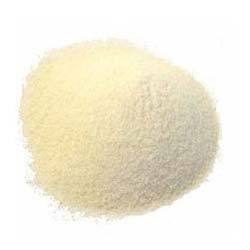 Generally rava is used to make rava upma or rava idli. Upma is a healthy breakfast or a filling snack. This rava pongal makes it more healthy with the addition of mung dal. Like upma, it is a one dish meal where you may add vegetables to it. Onions, beans, carrots, peas, potatoes, tomatoes, capsicum etc. may be added to this. You many add only one or a combination of vegetables to it. This recipe below is for the basic rava pongal recipe without any vegetables. Green or red chillies - 2 or more according to taste. Roast rava on mediam flame for 7-8 minutes, till it is imparts aroma. The color will be changed too. Do not let it get brown. Keep aside. Wash moong dal and add 1 1/2 cups of water to it. 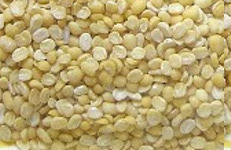 Cook moong dal in pressure cooker or on the stove top till it is soft and mushy. Chop green or red chilies in big pieces. Add mustard seeds. When they crackle, add chana dal, urad dal. Fry till dal is light brown. Add chili pieces. Fry till chilies look blistered..
Add cooked moong dal and water. Bring to boil. Reduce flame and add roasted rava stirring continuously. Mix well so as not to let form lumps. Cover and cook for 5 minutes on low flame. Stir in between. Add grated coconut, chopped coriander leaves. Mix well. You may roast rava in large quantities when you have time and keep it for making rava upma when you are in hurry. Saves time. Roasting rava or semolina properly while stirring on low or medium flame is important. Bread Upma- Quick Snack with day old bread. Poha - aval - beaten rice recipe - Savory beaten rice - rice flakes dish.